The two most delightf ul and memorable bites of a meal are the first and the very last. The first bite is preceded by anticipation: you wonder what lies ahead. The food hits your tongue and there is a joy as the flavors spread through your mouth. That final bite of dessert is the taste that will linger in your mouth long after you leave the table. The most memorable parts of a talk are the first words and the final parting thought at the end. The first words help the audience know if the flavor of your talk is one to which they want to listen. The final statement is the one that lingers in their mind as they walk away. Bill Jones knows more about this topic than me…. A strong opening grabs the audience and encourages them to listen. A strong closing demonstrates to the audience that you are confident and competent. Use these two opportunities to your benefit. Take time to plan and practice your opening and closing statements so you both create the anticipation in the minds of your audience and then leave them with the wonderful flavors of your talk in their minds. Do you have “favorite” terrible opening or closing lines you have heard? Hit the comment button and share them with other readers! © 2008 – iSpeakEASY – All rights reserved. Call for information on individual coaching or group workshops. Imagine making it through the first 26 grueling miles of a marathon and tripping and falling just before the finish line. How frustrating! All the preparation, all the work, all the sweat and you never reach your goal. Oddly enough, this is where many presenters fail – at the end. They do a fine job of preparing, creating great graphics, practicing, presenting and then lose credibility during the most useful and treacherous part of the talk – the question and answer period. During all other parts of your presentation, the speaker controls the content but during the question and answer period, the audience has the advantage. Whether speaking to a large audience or one-on-one, preparing for questions will help you maintain your credibility. Brainstorm questions you may be asked and practice your responses. Ask others what questions they think might be asked. Keep your answers short and to the point. Allow your host to field questions from the audience as this will diffuse potential hostility. Repeat or paraphrase questions back to the person asking. This affords you time to think, insures you answer the right question and tells the entire audience what question you are answering. Listen. Many speakers cut off the question before the person asking has finished. Watch the person who asked the question while you speak. This will help them feel you are speaking to them and will provide you with feedback on your answer. When you are done with a particular answer, ask if you have addressed their question. Be honest when faced with a question you do not know the answer to. Encourage the person asking to write the question down so you can research it and get back to them. Try asking if some one in the audience knows the answer. Prepare a closing remark for when you have finished answering the final question. You get the last word – make it count. Whether you are talking to an audience of 1,000 or speaking one-on-one, being prepared for the questions will increase your personal credibility and help you reach your desired end. © 2007 – This speaking tip is one in a series provided to you by iSpeakEASY. You are welcome to link to this page but reposting or printing this article require prior permission. Call for information on individual coaching or group training. The topic of the talk was the 7 key advantages to social networking. Seven. A good number, but much too high if the speaker expected the audience to remember the points. Instead of us learning the 7 ways social networking can help us, most people left the room remembering few, if any of the points she provided. How did this happen? As learners, we can only retain and organize a certain amount of new information when it is received. While the actual number is different for everyone, the magic number for most is 3 to 5. Most people can absorb, organize, and remember a maximum of 3 to 5 bits of new information at a time. When a person reaches their saturation point, rather than remembering everything up to that point – we tend to forget it all. If you pour water on a sponge, it will soak up and hold the water until it reaches saturation. Any additional water simply runs off, but the sponge holds what it first took in. With the human brain though, when we reach saturation, it is like someone squeezes the sponge draining almost all the new information that was gained. While her talk was good and informative, while she clearly is a subject matter expert, I left the talk an hour ago and am not sure I could tell you even one of the 7 points. My brain reached saturation and I lost it all. Effective presentations are built around 1 central theme or message. This message is supported by 3-5 sub topics or bits of information. Any more than that and you will lose too many of your audience members. If her talk had been on the 3 key elements of social networking, there is a greater chance the audience would have left remembering her words. 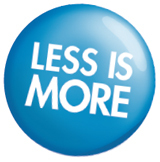 In presenting information, less is truly more. But only if you want people to remember your words. © 2011 iSpeakEASY – All rights reserved. Reprinting, copying, or reposting requires permission of iSpeakEASY. iSpeakEASY offers workshops to help you be a more effective speaker.